The Labour government’s efforts to boost the north’s economy were only partially successful, however. By 2010, the North East and North West enjoyed only a slight convergence in GVA per head with the national average, while Yorkshire and Humber had slipped further behind. The north remained over reliant on the government for wealth creation: The percentage of public-sector employment was higher than in any other English region. This left the northern economy acutely vulnerable to the government spending cuts enacted from 2010 onwards under the Coalition government, which dragged on the region’s economic performance. Indeed, economic growth in the three northern regions averaged a mere 2.0% in the 2010–2015 period, below the UK average of 2.5%. To achieve this aim, the former Chancellor set out several policy areas, including first and foremost transport. The north’s transport network is dated; congestion along key roads such as the M62 motorway is chronic, and trains are overcrowded and slow. Commuters in the southern town of Reading can cover the 40-mile journey to the heart of London in a mere 26 minutes by train. For those in the north, making a similarly long trip between Manchester and Leeds takes roughly twice as long. This is most evident in terms of regional autonomy, an area where Manchester has been a trailblazer. The Greater Manchester Combined Authority (GMCA), formed in 2011 as the amalgamation of smaller councils, has obtained the farthest reaching devolution deal of any northern region. Through a combination of technical competence and savvy negotiating, the city has wrested greater autonomy over housing and transport from Westminster, and is currently piloting the retention of 100% of locally-collected business rates to boost regional investment. A milestone was achieved in 2016, when the GMCA became the first English region to be granted full control of its GBP 6 billion health and social care budget. Keeping hold of the skilled workers the north does produce is no easy task either. London is a magnet for talent, bringing in the best and the brightest from around the country and draining the north of its most skilled workers. In 2014 and 2015, almost 40% of graduates with first or upper-second class degrees were working in the capital six months after finishing their studies. As a result, six out of ten Inner London residents are university graduates, roughly double the figure for the North East. Anecdotal evidence suggests some firms struggle to fill regional offices, despite the stratospheric cost of living in the capital. 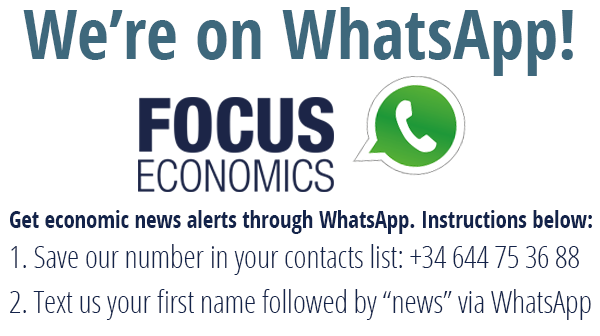 The UK economy as a whole is forecast to expand 1.5% on average over the next three years, according to the FocusEconomics panelists’ forecast. Will the Northern Powerhouse project be able to ensure that the north shares in this growth? To have any chance of lasting success, there needs to be firm political commitment, public policies targeted at boosting physical and human capital, and ample financial resources. Only then will the north be able to rise once more to the economic fore, just as it must have seemed to the passengers entering Liverpool Road station for the first time, nearly two centuries ago.